TIMBER TONES are made from 18exotic timbers arranged in hardness order. 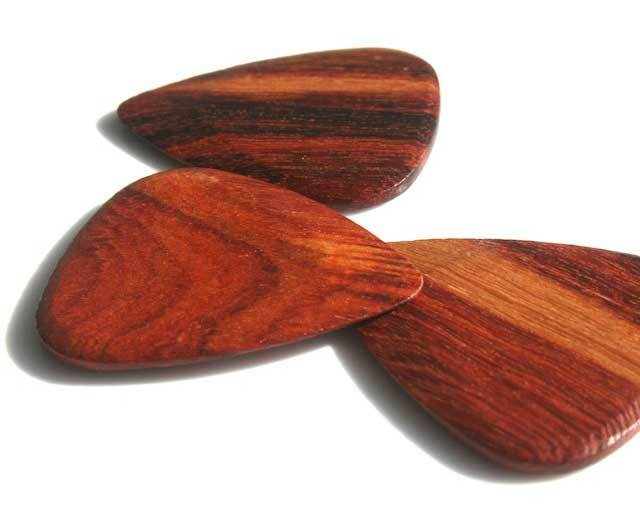 The materials used are primarily off cuts from Guitar manufacturing.The shape of the picks was developed in terms of playability, feel and sound enhancement. The woods have different degrees of hardness and strength, and thus offer the opportunity to produce the desired sound. The harder timbers are bright sounding and suitable for Electric Guitar, the softer timbers are warmer in tone and work very well with Acoustic Guitars.